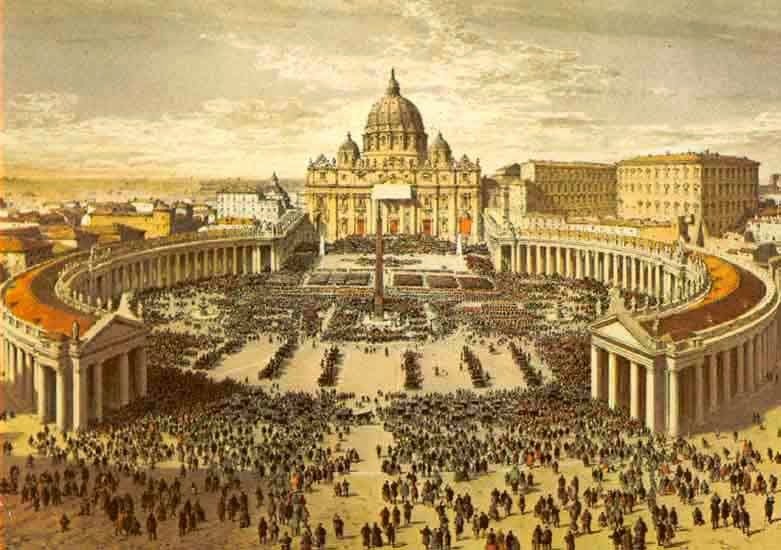 Et Verbum: The Catholic Church Alone. The One True Church of Christ. Part 111. The Catholic Church Alone. The One True Church of Christ. Part 111. Shortest Way to End Disputes. INFALLIBILITY PROMISED BY CHRIST TO HE CHURCH. AS The Divine Wisdom has permitted many sacred truths in holy-writ, to be wrapped up in dark figures, or enigmatical expressions, both to excite our industry in searching, and exercise our faith in believing, when they are explained to us by sufficient authority; so there are others so very clear and intelligible, that their meaning is obvious, and lies open to every sincere and unbiased reader. Of this sort, are many historical and moral tracts, both in the Old and New Testament; and I dare confidently say, that all the principal texts relating to the Infallibility of the Church, are of this nature. The word of God teaches it in the plainest and strongest terms. The promises of Christ are not wrapped up in parables, or a prophetic language, that requires deep searching to dive into it, but they are delivered in words so easy and intelligible, that any man, who makes it not his study to deceive himself, may understand them. The solemnity also of the circumstances, wherein Christ made those sacred engagements to his Church, is so remarkable, that they cannot but imprint an idea of some extraordinary favor bestowed upon her. His first promise of protecting his church against all the powers of darkness, was addressed to St. Peter, in reward of that noble profession of his Divinity, " which neither flesh, nor blood, but the Father, which is in Heaven, had revealed unto him." Matt. xvi. 17. The other promises v/ere made at his last Supper, in that Sermon, which is, as it were, his last Will and Testament, every word whereof, seems to be the overflowing of a heart, filled with concern for his future Church. It was then that Christ unbosomed himself to his Apostles, as a friend, or father; comforted them in their affliction for his approaching departure, and as a pledge of his unalterable love to his Church, bequeathed to them, " the Spirit of Truth," to be her guide and teacher to the world's end. All which he ratified again a few moments before his ascension into Heaven, when he gave his Apostles their commission, " to teach and baptize all nations," and encouraged them to undertake it with a promise of his perpetual assistance. Matt, xxviii. v. 20. I appeal, then, to the Word of God, for the truth and justice of the cause, which I have undertaken. The word of God, shall be the Judge between the Church of Rome, and the reformed churches. It is by this rule, I desire that this important cause may be decided. It is true, indeed, if I were to write against Infidels, there would be need of other proofs, because the authority of Scripture would be 1 questioned by them. But, since the cause depending, is not between Christians and Infidels, but between Christians and Christians, who all believe the Scriptures to have been written by Divine Inspiration, and to contain nothing but undoubted truth, there can be no exception made against the arms, I intend to make use of, in defence of my cause. Neither can I be accused of " running round in a circle," as is the usual objection; because the divine authority of Scripture, is as a postulatum which I take for granted, and use it as an argument ad hominem. And therefore, if I make it appear, that the doctrine of Infallibility is the doctrine of the Gospel, the doctrine of Jesus Christ, who is truth itself: then I shall have reason to hope, that all those, whom neither interest, nor passion can hinder from sincerely desiring to save their souls, will make it their endeavor to seek the truth in that Church, where it is infallibly taught. First, then, let us consider our Saviour's words to St. Peter, recorded in the 16th chapter of St. Matthew, I give them the first place, as being the clearest and strongest proof of an Infallible Church. For they contain an absolute and unconditional promise; there being no condition, either expressed, or hinted at in the whole text. It is a promise delivered in such clear and strong terms, that without straining the text in a very notorious manner, it can bear no other sense than that, in which the Roman Catholic Church has always understood it. The occasion of this promise is also very remarkable, as I have already hinted. St. Peter's name till then was Simon Barjona. But God having pre-ordained him to be the chief pillar of his Church, enlightened him in a particular manner, with a distinct faith of the Divinity of Christ, whereof he made this solemn profession ; " Thou art Christ, the Son of the living God." Matt. xvi. v. 16. Hereupon our Saviour dignified him with a title, suitable both to the firmness of his faith, and the eminent station he was to hold, and gave him the name of Cephas, or Peter; both which signify a rock. And then, as a further mark of distinction, he thus addresses to him the promise I speak of. "Thou art Peter [that is, a Rock] and upon this Rock I will build my Church, and the gates of Hell shall not prevail against it." Matt. xvi. v. 18. It is not my business here, to examine what prerogative this gave to St. Peter, in being alone called the Rock, upon which the Church was to be built. I shall only make my reflections upon the promise itself, by which Christ had engaged his word, " That the gates of Hell shall not prevail against the Church," that is built upon it: which, if it be not a proof of an Infallible Church, I own I am at a loss to find words clear and strong enough to express it. What other meaning can we give to the words of Christ, that will bear any connection with their obvious and natural signification? That they contain a promise, is plain. That the promise, which they contain, is made to the Church, is no less plain; and since all God's promises have a relation to some favor, it remains only to consider what this favor is. First, then, Christ promises "to build his Church upon a Rock." What does this mean ? Is it probable that Christ, who foresaw every thing that was to happen, would have told St. Peter, That his Church should be built upon a rock, if he had foreseen its future fall ? Had he no design, that the Rock upon which his Church was to be built, should be a firm and lasting foundation to it? Or did he act by chance, and without end, or design ? But Christ himself has answered all these questions in the following words: " I will liken him unto a wise man, who built his house upon a Rock; and Christ Himself instituted the sacrament of the altar the night before His passion. The three first evangelists and St. Paul give the history of the institution of the first Eucharist. Our Lord, they«tell us, took bread into His hands, and having given thanks, He took it and gave it to His disciples, saying, "This is my body, which is given for you ; this do as a commemoration.of me." Digitized the rain descended, and the winds blew, and beat upon that house, and it fell not, for it was founded upon a Rock. Matt. vii. 24, 25. Whence it is plain, that Christ, by promising, that his Church should be built upon a Rock, intended to assure us, that its foundation should be so strong, so deeply laid, that it should stand in spite of all storms, oppositions, or any efforts whatever to make it fall. And therefore, to prevent the very possibility of all but wilful mistakes, in the second part of the promise he explains himself, and declares positively, " That the gates of Hell shall not prevail against it." Which words contain two things. First, they imply a general prediction of what should happen to the Church, from the efforts and malice of her enemies, who should oppose, or endeavor to corrupt her holy doctrine. And secondly, a positive assurance, that all their strength and malice, which our Saviour calls "the gates of Hell," shall never prevail against her. The prediction has been fully verified. The Jews, the professed enemies of Christ, were the first champions of Satan, who declared themselves openly, and made many furious assaults upon his Church. These were soon followed by several apostate Christians, as the Ebionites, the Nicolaites, the Corinthians, and many others, who conspired together to corrupt the purity of her doctrine. But the ten bloody persecutions raised by the Heathen Emperors in the three first centuries, aimed at nothing less than to extirpate the Christian Religion, and destroy the Church, root and branch. When these storms ceased, and the Church was delivered from foreign enemies, her own bowels again rose up against her, in so violent a manner, as seemed to threaten her utter ruin. Arius, and his followers supported by the secular power of Christian Emperors, and a great number of apostate Bishops, made a furious war upon her for many years together. All the means, that artifice, or malice could suggest, were employed to undermine the very foundations of Religion. The most zealous Catholic Bishops, were either murdered, or imprisoned, or sent into banishment; so that the wolves being let in amongst the flock, every thing seemed to tend to the utter extirpation of the Catholic Faith. This was the state of the Church in those turbulent times: and her condition has in some measure been the same from time to time, whenever the Devil and his Ministers made any new attempt upon the purity of her Faith; as has happened almost in every age from the very infancy of the Church, to this time downwards. So here we see the " Powers of Hell" have always been armed against the Church, and the prediction implied in the fore-mentioned text has been fully verified. But we have not as good security of the effects of Christ's promises, as for the event of his predictions ? Is he not equally infallible, when he promises blessings, as when he foretells calamities and disasters ? There can be no doubt of it. And, therefore, though the Powers of Darkness will never cease to make war upon the Church, their efforts will always be as vain, as the winds and rain against a house, that is built upon a Rock. And as her Faith has stood the shock, both against the united force of Jews and Pagans, and the deceitful reasoning of Arians, Nestorians, Eutychians, Donatists, Pelagians, and others; so will it remain immovable and incorruptible to the world's end. And this is so manifest a truth, that to deny it, we must either interpret the Scriptures backwards, or give our Saviour flatly the lie. For, if words retain their usual signification, we cannot charge the Church of Christ with error, even against any one single article of Faith, but we must draw this impious consequence from it, that he was either ignorant of the event of his promise, or unfaithful to it; and that after having in so solemn a manner, engaged his sacred word to St. Peter, that" the gates of Hell shall not prevail against his Church," he has nevertheless delivered her up to the power of Satan, to be destroyed by him. This consequence will appear undeniable, if we consider the two following truths, viz. : 1, That Faith is essential to the Constitution of the Church; and 2, That Heresy destroys Faith. For it plainly follows hence, that if the whole Church falls into Heresy, she is without Faith, and is no more the Church she was before, than a man can continue to be a man without a Soul. The Church of Christ, (as I shall show hereafter) can only be that, which believes wholly and entirely, the doctrine that was taught by Christ, and delivered to her by the Apostles. If, therefore, she ever renounced any part of that doctrine, does it not follow that she then turned Apostate? That she ceased from that moment to be the chaste Spouse of Christ? That "the gates of Hell prevailed against her ? " And, that, by consequence, our Saviour, in permitting that to happen, which he promised should not happen, was unfaithful to his word ? Again; Christ either foresaw, that " the gates of Hell should not prevail against his Church," or he foresaw it not. If not, then he promised he knew not what, which is blasphemy. But if he did foresee it, then (since his foresight was infallible in every thing) the event must answer it infallibly; and so it must be infallibly true, that the gates of Hell never have prevailed, nor ever will prevail against his Church. In a word, I take this to be a demonstration. The gates of Hell (according to Christ's own words) will never prevail against his Church; but, if she falls into any error against Faith, the gates of Hell prevail against her; therefore, she cannot fall into any error against Faith. Therefore, she is Infallible in all matters of Faith. If it be asked, how any Congregation, or Society of men can be Infallible, since all men (as the Psalmist says) are Liars, that is, subject to errors ? My answer is, that all men of themselves are certainly subject to errors, even in the most ordinary things; but much more in matters of Faith, which are above human reason. And, therefore, if the infallibility of the Church was to depend upon the judgment, wit, or learning of men, it would have but a very weak foundation, and would be like " the House of the foolish Man built upon the Sand, which was overthrown by the Winds and Flood that beat upon it." Matt. vii. 26. But our Saviour was not this foolish Man: for he did not tell St. Peter, that his Church should be built upon the Sand, but that it should be built upon a Rock, and that therefore, " the gates of Hell should not prevail against it;" and we cannot doubt, but he has made good his words, and has found means to do it, notwithstanding the natural weakness and fallibility of the members, whereof she was to be composed.